Thankfully, finding the Site Settings page in SharePoint 2016 is as easy as two clicks of the mouse. Click the Settings gear icon and choose Site Settings. Opening the Site Settings page. When the Site Settings page loads, you see a number of links all grouped into various categories. The Site Settings page can be daunting and overwhelming. Don’t worry, though. 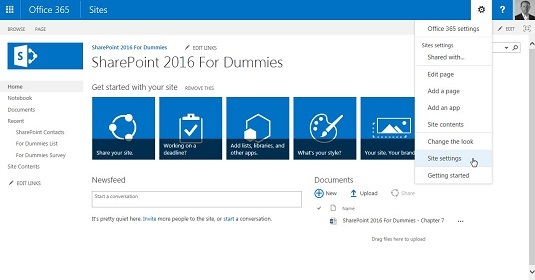 As you administer a SharePoint site, you will become familiar with all the various settings pages and become an expert before you know it. 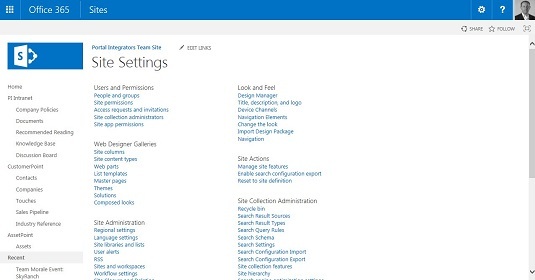 The Site Settings page in SharePoint. Different settings links appear and disappear, depending on your particular permissions and the type of site you are administering. For example, if you’re a site collection administrator, then you see the Site Collection Administrators link under the Users and Permissions section. If you’re not, then you won’t see this link or even the entire Site Collection Administration section. If you read about a settings page but can’t find it, then chances are you don’t have permissions or you are working with a site that does not have that particular setting. This can occur, for example, if the publishing feature is activated or not. In general, SharePoint shifts around links and names depending on how the site is set up.